Who invented Concrete? The Ancient Romans are generally credited with the invention of concrete due to their prolific use of the material, although similar building materials were used in construction techniques applied by the Mesopotamian, Egyptian, Chinese and Greek civilizations. The 'secret' of Roman concrete was their addition of volcanic ash which was readily available due to the volcanic eruptions of Mount Vesuvius, the Monte Albano volcano and several other volcanoes on the Italian mainland. How was Roman Concrete made? Roman concrete was made by mixing a strong volcanic material, called pazzolana or "pit sand", with coarse materials used in construction called aggregates. The construction aggregate used to make Roman concrete was rubble and limestone with the addition of water and the volcanic ash to create a mixable paste called a mortar. The Romans also used Tuff, from the Italian word 'tufo' as an aggregate, a type of rock made of volcanic ash to make concrete. Definition of Concrete: Concrete is defined as a strong hard building material composed of sand, broken stone, pebbles, gravel, cement and water that hardens into a stone-like mass. Concrete is adaptable, fire resistant and is now used by semi-skilled workers for the construction of modern sidewalks, roadways, foundations, etc. Fact 1: Who invented Concrete? The name of the inventor of Concrete is unknown but it is believed that concrete was invented c200 BC during the Ancient Roman era of inventions (600 BC - 400AD). Fact 2: Who invented Concrete? Prior to the invention of Roman Concrete the first mortars were made of mud and clay, using pitch for mortar. Due to a lack of readily available stone and an abundance of clay, the constructions built by the Babylonians of Mesopotamia were made of baked brick, using lime or pitch for mortar. Fact 3: Who invented Concrete? Gypsum mortar, also called plaster of Paris, was used in the construction of the Egyptian pyramids. Gypsum mortar and Lime mortar, composed of lime and an aggregate such as sand, mixed with water, were used in the construction of structures built by the Ancient Greeks. Fact 4: Who invented Concrete? Any concrete, consists of an aggregate and mortar, a binder mixed with water that hardens over time and used to bind building blocks such as stones, marble and bricks. Fact 5: Who invented Concrete? An aggregate consisted of the coarse materials used in construction. Mortar is a mixable paste or binder used in building for holding bricks or stones together. Fact 6: Who invented Concrete? The development of Roman concrete began when Augustus Caesar (63BC - 14AD), the first Roman emperor, initiated an extensive building program in Rome which resulted in an explosion of building industries in Rome and the extensive use of Roman concrete. The Emperor Augustus famously said "I found Rome a city of bricks and left it a city of marble". Fact 7: Who invented Concrete? The Roman builders and engineers experimented and refined the production and use of aggregate and looked for readily available materials to use in their construction projects. The region around the Monte Albano volcano, only 12 miles southeast of Rome in the Alban Hills (Colli Albani), was heavily covered with meters thick beds of pozzolana, volcanic ash and tuff from previous eruptions. Fact 8: Who invented Concrete? The Roman builders began to mix the strong volcanic material with other coarse materials used in construction and produced concrete. Layers of volcanic ashes were several feet in thickness and thickly deposited across regions surrounding volcanoes. Fact 9: Who invented Concrete? 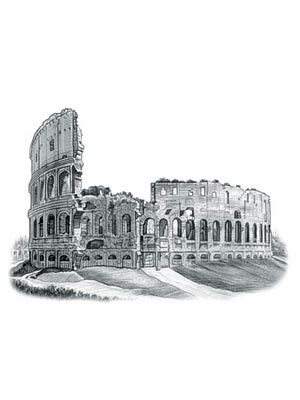 The method used by the Romans to produce concrete started with heating limestone to produce quicklime. Water was added to the quicklime to create a paste. Volcanic ash was then added to the concrete mixture. Fact 10: Who invented Concrete? The proportions used to create concrete, three parts volcanic ash to one part lime, were detailed by a famous architect and engineer called Marcus Vitruvius Pollio in his 'Ten Books on Architecture', which he dedicated to his patron, the Emperor Caesar Augustus. Fact 11: Who invented Concrete? The volcanic ash reacted with the quicklime paste to create a durable mortar that was combined with bricks, or volcanic rocks called tuff. Fact 12: Who invented Concrete? Tuff, from the Italian word 'tufo', was often used as an aggregate. Tuff is a type of rock made of volcanic ash ejected from a vent during a volcanic eruption. Fact 13: Who invented Concrete? The durable mortar developed by the Romans was called Pozzolanic mortar, a lime based mixture made with the additive of volcanic ash. Fact 14: Who invented Concrete? Pozzolana is a fine, sandy volcanic ash. The Pozzolana found on the lands around the Monte Albano volcano near Rome was a reddish-brown color. But there were other volcanoes in Italy and Pozzolana was mined at other sites. The best known being Mount Vesuvius, situated near Naples, its volcanic ash was a brownish-yellow-gray in color. Fact 15: Who invented Concrete? The name Pozzolana, derives from the modern-day town of Pozzuoli situated just 25 miles east of Mount Vesuvius in the Bay of Naples. The famous Roman scholar Pliny the Elder, who died attempting the rescue of his family from the eruption of Mount Vesuvius in A.D. 79, had written that the best maritime concrete was made from volcanic ash found in regions around the Gulf of Naples, especially from near the modern-day town of Pozzuoli. Fact 16: Who invented Concrete? The volcanic ash dug from around Pozzuoli became so well-known that ash with similar mineral characteristics, no matter where in the world it was found, was dubbed pozzolana or pozzolanic ash. Fact 17: Who invented Concrete? Other volcanoes found on the Italian mainland are the Campi Flegrei, Larderello, Amiata, Vulsini and Roccamonfina volcanoes and all proved excellent sources of the volcanic ash (pozzolana) required in the Roman formula for its highly durable concrete. Fact 18: Who invented Concrete? The Great Fire of Rome in 64AD destroyed large parts of the city. The Emperor Nero (37 AD – 68 AD) decreed that the city of Rome was to be rebuilt and this monumentous task, the biggest single building project in ancient history, was accomplished quickly using brick-faced concrete as one of the most important building materials. Four years after the Great Fire the Emperor Nero committed suicide, but two thirds of the city of Rome had been re-built. Fact 19: Who invented Concrete? The invention of the highly durable Roman Concrete made it possible to build lasting monuments to Rome, which we still gaze at in awe and wonder 2000 years after they were built. Fact 20: Who invented Concrete? The Roman Colosseum oval in shape, 615 ft long, 510 ft wide, 187 ft high with a base area of 6 acres was built in A.D. 81 - it took less than eight years to build. Vaulted arches added strength to the building without adding excessive weight - the Colosseum would never have survived without the use of concrete. Fact 21: Who invented Concrete? After the fall of the Roman Empire in 476 AD the techniques for making pozzolana concrete were lost for hundreds of years. Fact 22: Who invented Concrete? In 1824, an Englishman named Joseph Aspdin (December 1778 – 20 March 1855) invented the first true artificial cement which became known as Portland cement, due to its resemblance to Portland stone. In 1867 Reinforced Concrete was invented by the French inventor Joseph Monier. Who Invented Concrete? - Invention - Definition - History - Timeline - Meaning - Famous - Device - Innovation - Significant - Development - Building and Construction - First - Definition - Kids - Facts - Information - Info - Who invented Concrete - Dates - When - Why - Impact - Purpose - Use - New - Old - Definition - Meaning - Awesome - Cool - Concrete History - Timeline - Roman Empire - Who invented Concrete?